everyone is heavy on the Utra-soft. An onboard of the circuit with the RB13. It looks like this track has very high speed corners. My first impression is that the race will be decided by qualifying again. I don't see how the cars will be able to follow each other. Maybe we will get overtaking opportunities if they utilize the really long straight. yes fingers crossed......"merc" spec tyres and an new engine update from Mercedes. I say bring it Mercedes...game on. Brothers I will be on vacation during this 3GPs, does anyone know a good streaming app for Android so I could watch, payed app of course? Does not F1 have a streaming service app for any of the android phones??? I would look into that. K zike, I believe it's a different app.....look around some more....ya got time. Looks like the #FrenchGP not starting until 15:10 UK time means that @Channel4's highlights of the race will not air until 22:10, according to provisional schedules. [Sportbild] The new Mercedes engine that will debut in the #FrenchGP are expected to bring 0.3s quicker lap times than the previous one. I really hope the team gets the car set up correctly for these tires this time. The cars! Ferrari needs to remember Kimi is still on the team. Points from either driver count!! This is what I still don't understand about the "special" tyres and why they were produced in the first place. Look, the season starts of with a set of rules that all have to abide by. Within these rules there are seven dry compound tyres designated for the season that everyone agrees to. Pirelli introduces two new sets for the 2018 season but they are in essence rebranded and they make the entire range softer. So this year's superhard is actually last year's hard tyre (or thereabout). That tyre is also decided to be the emergency/back up tyre should something go wrong during the season. Fast forward to pre-season testing. It turns out "some" teams have problems with some of them during testing at Barcelona and they blister. By that time Pirelli haven't decided on the compounds for the Barcelona race. They think they have a good picture but in reality they don't (medium, soft, supersoft...madness on that circuit, new asphalt or not). So when Pirelli sees the problems in testing, what do they do? Do they go to the emergency tyre (last year's hard tyre and used in 2017) when they decide the compounds for the Barcelona race? No, they invent new compounds, shaving off some rubber, but call them the same name as the other tyres with more rubber. During the race weekend Ferrari struggles on the new "special" compounds but Merc doesn't not at the latter team score an easy 1-2. Ferrari who are not know to complain in the middle of a racing season let it slide. But they make their feelings known, directly and indirectly. So here we are prior to the next round when the "special" tyres will by used. At Paul Ricard. Yes, Pirelli announced the compounds for Paul Ricard on april 20, almost a month prior to the Barcelona race. But they already knew about the problems from testing and the race result in Barcelona should only have confirmed that their and the FIA's behavior is unsportmanlike by changing compounds once the season have started. Instead, along with the FIA, evoke some sort exemption clause and make it possible to change the compounds for Paul Ricard back to the original ones (meaning go harder to avoid probable blisters on the softer, normal ones) they still go ahead with their original plan and bring modified "special" softer compounds to the race. Meaning, nothing has changed. So here is the question. If Ferrari get beaten, soundly, by Merc and maybe also RBR at Paul Ricard, what will that say and what will happen for the Silverstone race? Will Ferrari still bite their tongue and let it slide or should they make a formal protest and request the original compounds for the british GP? 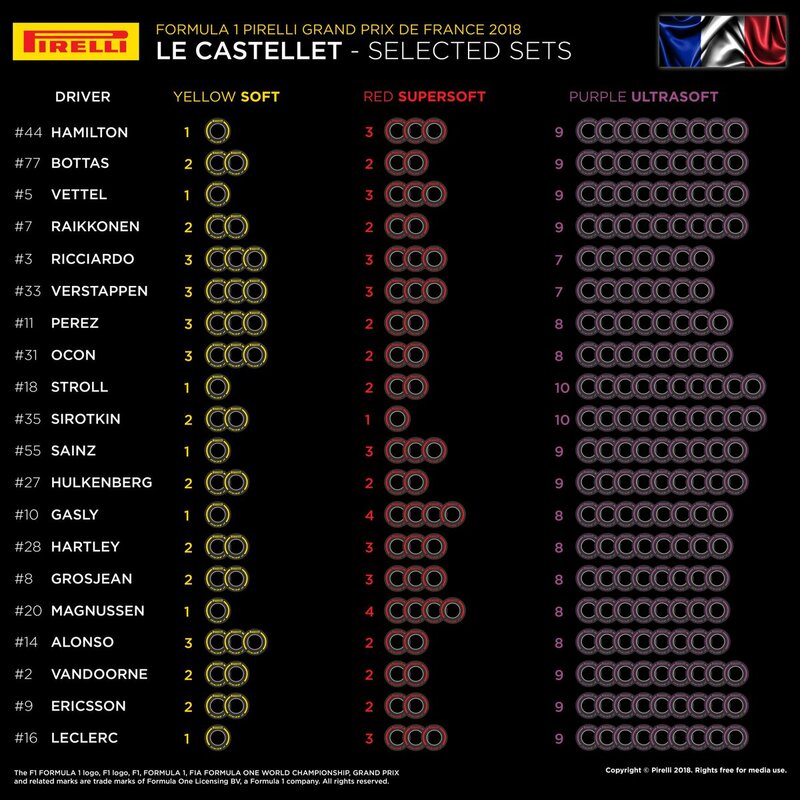 Now, we know Pirelli will bring the hard compund for the first time this season to Silverstone but will it be the original hard one from the start of the season or a "special" hard one made for that race only? What it in essence boils down to is the question of how fair, sporting-wise, it is to change compound structures once the season has started and especially if there is an emergency tyre designated for the season, the super hard, should problems arise. It's completely irrelevant what the post-Barcelona race test showed as it's impossible to know how Ferrari would have done compared to Merc on the original tyres during the race. Maybe Merc would have struggled even more and maybe it would have been a three-stop race (or more). Mercedes engine rumours 3 tenths faster i say bull they have a quality problem one week and 3 tenths the next good luck with that and to the poor suckers that swallow it have a little of the same its all a game. Totally get what you're sayin....I'm WAS in the same mind set as you were/are. But in all fairness Ferrari was testing a new suspension(rear) during the Spanish GP (first time these new shaved tyres were tried) and it did'nt work out for Ferrari with regards to tyre degredation. So going forward, Paul Ricard is the 2nd track with these shaved tyres. I don't know if Ferrari will test another new rear suspension (IMO I doubt it for this track and tyre), so hopefully we get back to the way we were when it comes to tyre longevity. By the way, this is not the first time Pirelli introduces "a new tyre" for a few GP's in a given season....they've done it in the past. Also, all teams throughout the year has 2 days of Pirelli testing (wet)....plus they do other "testing" [cough...secret testing...cough] while doing the Pirelli testing. I guess we'll just have to wait and see if it was a suspension problem as I guess they won't be testing any new suspension at Paul Ricard. But if Lewis wins by +20 seconds, then what? And what if RBR is ahead as well? I know it's not the first time and it's not the point as earlier year's modifications were done for safety reasons. The modifications this season has nothing, officially, to do with safety. Also, pre-season testing is part of the upcoming season. The 2018 F1 season started on february 26. Rules should be rules, except for safety concerns. Blisters are not a safety concern. Just run a harder tyre. Yes, let's wait and see. Supposedly, Paul Ricard is like Montreal (and that was suppose to be a power track favouring Mercedes..well it did in the past....not so now!!). I guess the criteria will be the tyres. I say bring it. FP1 and FP2 again will be about setup and by FP3 we should have the car dialed in (hopefully GIO does not get called in and do another 8hr SIM at Maranello...but it is a new track...so maybe). Im anxious to see FP3 and quali. I agree, if a team has a problem cooking their tyres...guess what....that's the teams problem. Pirelli should have said, "Hey, don't make your problem my problem!!!" "You fix it." Reports say a conspiracy regarding Pirelli caved into Mercedes demands and other reports say Pirelli were already going to do this anyways regardless of what the nay-sayers say...I myself tend to lean more towards the former rather than the latter. I saw those tyres during testing (Barcelona testing---2 weeks prior to Melbourne) and Mercedes were the only ones that "cooked" their tyres....no one else (Toto said RedBull had the same issue....whatever!!!) cooked their tyres. First, Seb in the after race test in Spain tried the original tires, and he said it would have been worse for us. Second, harder tires are better for Merc, they can make the medium go as fast as the soft, and nearly super soft levels. harder tires are our enemy. More than Merc itself. So stop complaining for the tire change. Well its just a speculation, from ORF (Austrian) tv I heard that the the new Mercedes engine is worth about 0,1s-0,15 s per lap. Yes the new tyres for France gp should suit Mercedes more, but we still have US,SS compounds on which we are strong, also high-speed corners with fantastic aero efficiency of our car should play into our hands. Will see.